Heavens to Mergatroyd: Chitra Nagarajan also joins Mikki Kendall's campaign of hatred against white feminists. Chitra Nagarajan also joins Mikki Kendall's campaign of hatred against white feminists. 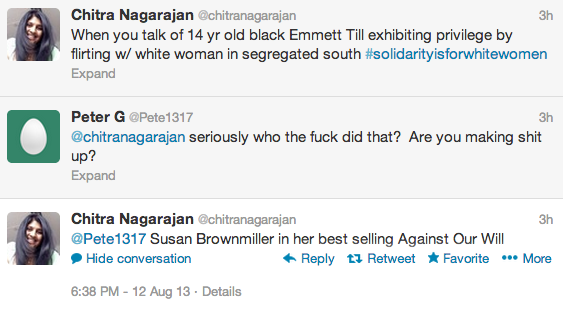 Here is Chitra Nagarajan attacking Susan Browmiller, implying that she is an evil racist feminist (but of course she is because she's a white feminist) by misrepresenting something she said in "Against Our Will." Nagarajan is a writer at The Guardian. It is truly appalling how many women with their own media outlets have taken up professional hater Mikki Kendall's cause of attacking all white feminists, including feminist pioneers like Susan Brownmiller. Mikki Kendall is truly a force for evil. Here is Nagarajan's Linked-In profile. I can't believe any respectable organization would employ this vicious hate-monger.